Hearing those who follow Jesus shout praises to him, others rejoice, saying, "Hosanna! Blessed is the King of Israel who comes in the name of the Lord!" TIME OF great excitement was on. People were flocking out of the city gate and hurrying along the road that led down the valley and up the slope of Mount Olivet, just outside of Jerusalem. They were rushing out to meet Jesus, of whom they had heard such great things. Many of these people were strangers in Jerusalem. They had just come to attend the Feast of the Passover, and they had heard about the wonderful miracles Jesus performed. Others lived in Jerusalem and they had heard how Jesus raised Lazarus from the dead, so they, too, were eager to see him again. As they went they took branches of palm-trees with which to wave in a welcome when they should meet him. On the morning of that same day Jesus had sent two of his disciples to a village near Bethany to loose a colt which they should find tied. He had told them to bring this colt to him, and if the owners should question why they untied the colt they should answer, "The Lord has need of this colt today." And the disciples had gone and found the colt tied by the roadside, and they had told the owners the message which Jesus sent. And the owners had let them take the colt and bring it to Jesus. Then the disciples had spread their garments on the colt's back and had set Jesus on it, while others threw their clothes along the road for Jesus to ride over. And as the crowd from Jerusalem came near to the Mount of Olives, the company which followed from Bethany began to shout, "Blessed is the King who is coming in the name of the Lord! Peace in heaven, and glory in the highest!" The people who came out of Jerusalem met Jesus and his disciples on the slope of the Mount of Olives. They heard those who followed Jesus shout praises to him, and they too waved their palms and rejoiced, saying, "Hosanna! Blessed is the King of Israel who comes in the name of the Lord!" Some threw their palms in the road for him to ride over, and all along the highway they stood, rejoicing greatly and praising God. In the crowd were some Pharisees who had not come to rejoice but to find fault. When they heard the people shouting they came to Jesus and said, "Master, cause these to cease shouting." Jesus answered, "If these should be still the stones by the roadside would immediately cry out." Jesus knew the time had come when the prophecy of Zechariah should be fulfilled, for Zechariah had said concerning this very time: "Rejoice greatly, O daughter of Zion; Shout, O daughter of Jerusalem: Behold, your King comes unto you: He is just, and having salvation; Lowly, and riding upon a colt." 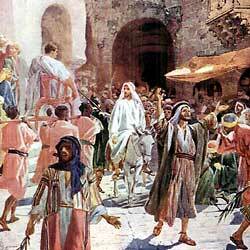 So the crowd passed on through the gate into the city, and Jesus rode up Mount Moriah, where the temple stood. And as he went, the people before and behind cried out aloud, "Hosanna to the Son of David." The people in the city were stirred with the excitement. They came hurrying into the streets to ask, "What is the meaning of all of this? "Who is this king you are bringing?" And the multitude answered, "This is Jesus, the prophet of Nazareth, of Galilee." Then Jesus entered the temple and looked about upon the things there. Taking his disciples, he returned to Bethany to spend the night in the house of his friends.